Colleen Lachowicz, a Democratic candidate for the US Senate, has come under fire for playing World of Warcraft. Her Republican opponents went so far as to set up an entire website documenting her various activities on WoW at http://www.colleensworld.com/. But what is so bad about WoW, or any other online game? The insinuation seems to be that Ms Lachowicz is in some way either (a) a slacker who plays computer games, or (b) a violent individual because that computer game is violent. These are two misconceptions that need to be put right. On the first point, I don’t see how investing time in a social, online game is any worse than many other hobbies. I know people who enjoying jogging or stamp collecting. You could suggest that jogging is more active and so contributes to health, but WoW is MUCH more sociable! You could say that stamp collecting gives you a physical collection of objects at the end, but that is simply a luddite’s inability to grasp the concept of the “webome” – the online analogue of the genome consisting of the collection of data that represent our online identity. The link between violence in films and computer games is far from certain. It may be that to some extent we are desensitised to certain kinds of stimuli that are contained within the media that we consume. However, recent studies suggest that actually aggressive behaviour is not linked to violent games at all. In fact, success in these kinds of games often requires a level of cooperation with other people (be they real or computer-created characters) in order to succeed. The games also provide intense problem solving situations involving a great deal of strategy and planning. Anybody who has ever been scolded for low DPS by a theory-crafter knows all to well that there is a sizeable intellectual element to games like WoW! Scientists have already embraced the medium of online games. 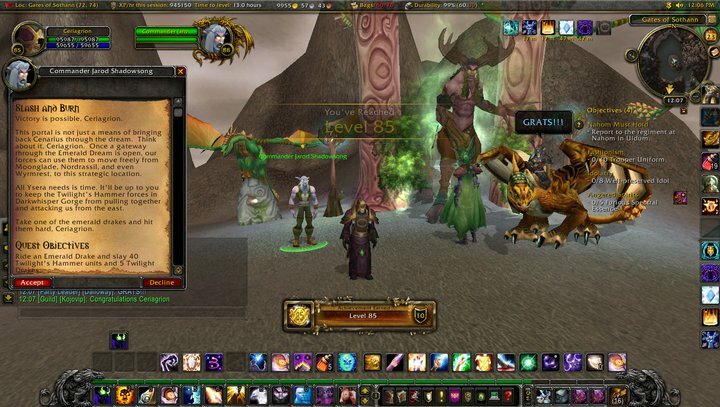 These massively multiplayer online role playing games (MMORPGs) have demonstrated fascinating emergent properties that have led to a number of scientific findings. In particular, the 2005 Corrupted Blood incident, where an outbreak of an in-game virus occurred due to a glitch in the game, led to a huge “natural experiment” involving how disease was transmitted between individuals. Three years later, the first scientific conference was held on online games, involving a series of “field trips” around the world of Azeroth. Far from being a menace to society, games can be a genuinely positive force, as outlined by researchers such as Jane McGonigal in her TED Talk. 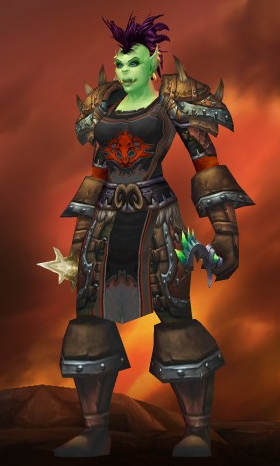 Besides all the cool kids play WoW. By way of proof, I give you the screengrab from the moment that I hit the level cap with my Holy Priest. FOR THE ALLIANCE!! While I may no longer play WoW, and I have my own issues with it’s quality, it has still given me many hours of enjoyment, and really doesn’t deserve this kind of treatment. Neither does Colleen Lachowicz or anyone else who is wrongly judged for playing video games. Gamer Solidarity!